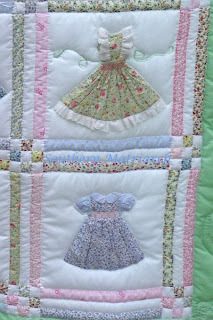 Not really sure doll quilt is the right name for this. 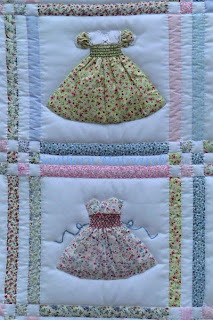 It uses the patterns from Kreations by Karon, which in spirit are miniatures of little girls smocked dresses. Our chapter smocked, embroidered and constructed the quilt to be our convention basket for SAGA convention. We also hold an annual auction every year as our major fundraiser so a second quilt is in progress for that. If you would like raffle tickets for that email me through my profile. 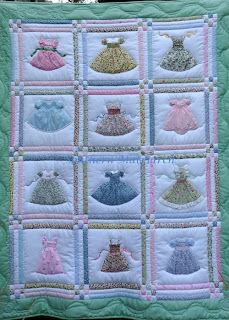 Each block is a different smocked dress. 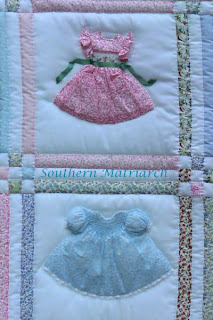 THe little bishop is the dress that I did, I talked about it here as the tiniest smocked bishop. I loved working on it. It is a lawn. I put a tiny bit of tulle in the sleeves so they would puff. We used lined pique for the blocks themselves. A dream to work on. 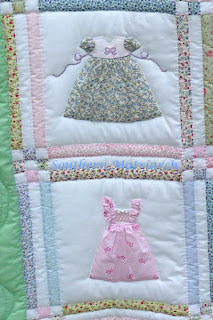 The pink pinafore dress above has the teeniest tiniest rick rack trimming the pinafore. So cute. Kudos to the member who worked on that block. The committee selected fabrics, made up kits and passed out kits at a chapter meeting. As each member completed their block, the committee constructed the quilt top. A chapter member's mom hand quilted it for us. In record time I might add. I love the basic yoke with the white collar and cuffs. And the sundress is a cutie too. This is a great project for a group to work on. Or to recreate some of your favorite garments. 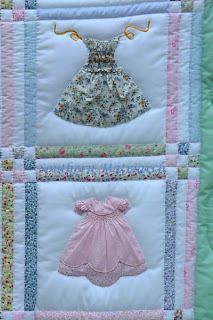 Since I bought the first few patterns I notice she has added christening gown patterns. Now how fun would that be!!! As a raffle basket at convention this was very popular. The box was stuffed full of tickets. A member of the Midnight Oil Smockers in the Houston area won it. Lucky girl! 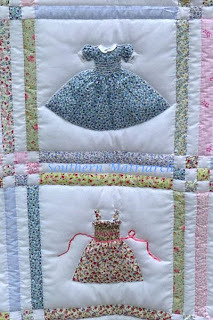 I have fallen in love with this quilt and the idea of doing this with scraps from my daughter's dresses. Thanks for showing detailed pictures.